I feel as if I'm always bitching about the weather, but October and November were a total bust! ; it was hot and humid, and now the temperature is finally cooling down, but it's still as humid as a freakin' rain forest. Are any of you in Tokyo or anywhere in Japan, struggling as much as I am? 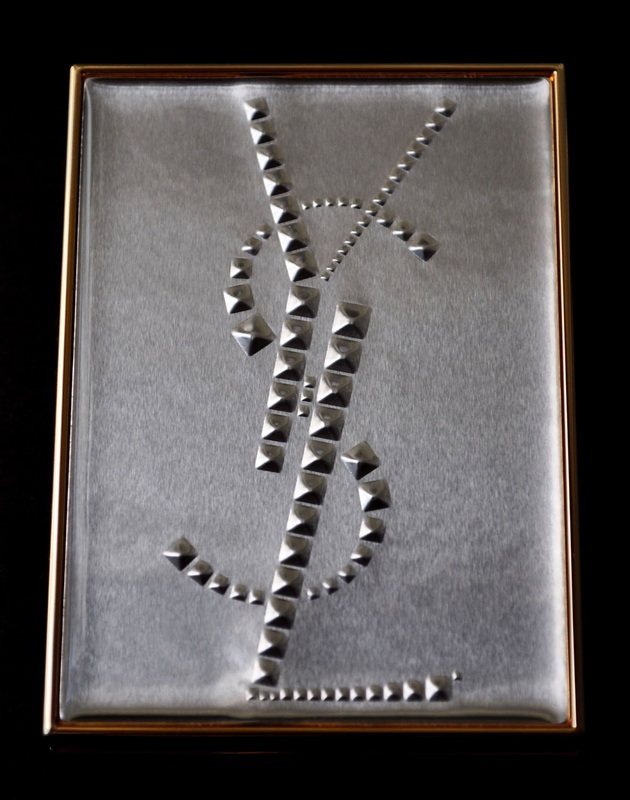 Anyway, moving onto a more pleasant topic and makeup with an edge, YSL's Fall 2015 Rebel Metal Collection. I picked up the Metal Clash Couture Palette, and the Rouge Volupte Shine lipsticks in 35 Fuchsia in Grunge and 36 Rouge in Rock. The exterior casing resembles sheet metal, with the YSL logo textured in pyramid studs and covered in a rubbery plastic, is a punk rock girls dream come true. Isn't the color combinations of the Metal Clash Palette sickening?! The palette offers three finishes: a glittery satin, two satins, and two shimmery shadows. A medium camel-gold with gold shimmer. A reddish-pink-burgundy with flashes of lilac. 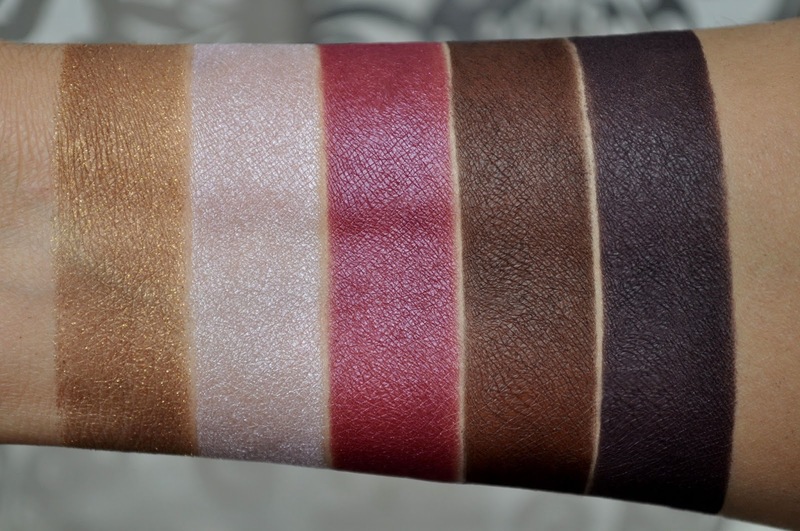 All five shadows are richly pigmented, apply and blend exquisitely! 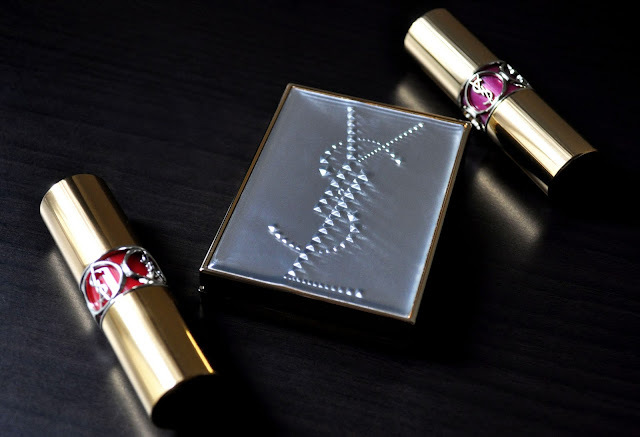 I have a love-not-so-much-like relationship with YSL's Rouge Volupte Shine lipsticks; at times, their scent can be a little much for me to handle. From left to right: 35 Fuchsia in Grunge, 36 Rouge in Rock. 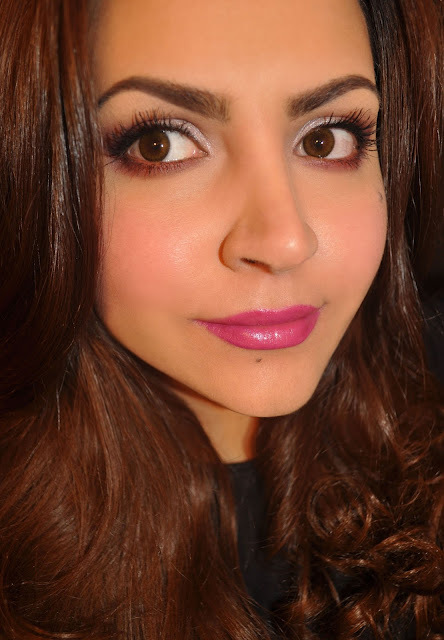 35 Fuchsia in Grunge: a bright, pink-fuchsia with purple undertones. 36 Rouge in Rock: a bright red with orange undertones. 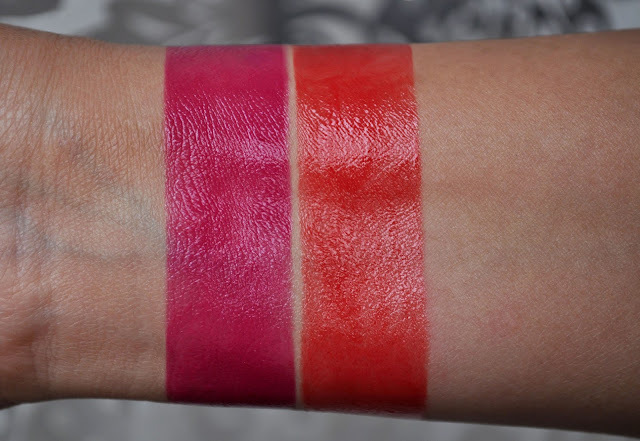 Neither of these shades are what I would normally gravitate towards during the Fall...and having grunge and rock in their names, I expected edgier shades. Nonetheless, they pair gorgeously with the Metal Clash Palette. Yves Saint Laurent Creme de Blush in 07. The pinkish-lilac shadow (patted on one-half of the lid). 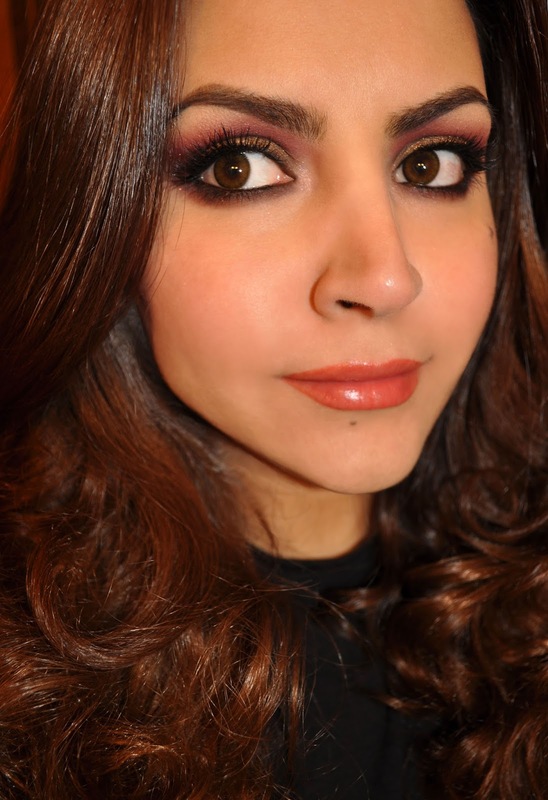 The burgundy shadow (blended inward on one-third of the outer lid and lower lashline). The plum shadow (blended in the outer corner, and over the eye liner used on the upper lashline). Lancome Le Crayon Khol in 11 Cafe Serre (on the upper lashline, used to tightline and lightly placed on the water line). Mac Lip Liner in Heroine (softly blended all over the lips). 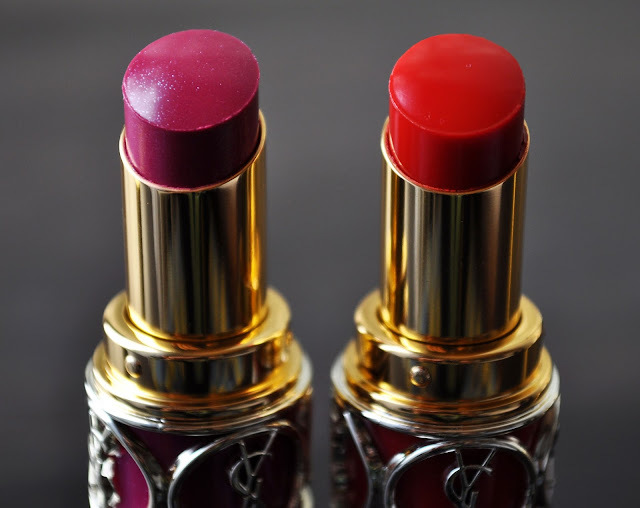 Yves Saint Laurent Rouge Volupte Shine in 35 Fuchsia in Grunge. Yves Saint Laurent Creme de Blush in 08. Giorgio Armani Eye & Brow Maestro in 10 Mahogany (all over the lid). The chocolate brown shadow (on the lid and slightly blended into the crease). The gold glitter shadow (patted over the chocolate brown shadow). 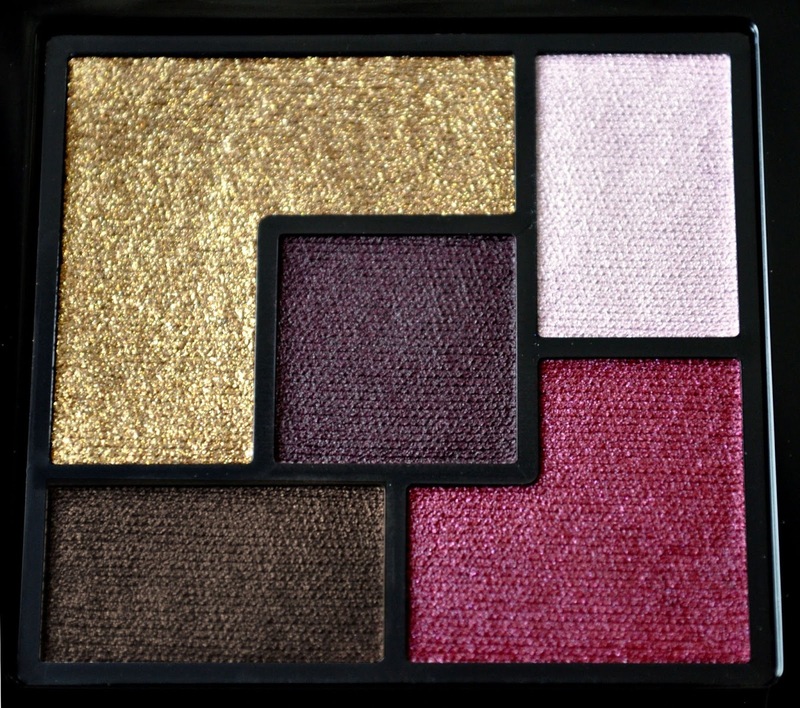 The burgundy shadow (blended into the crease and up to the inner crease). The plum shadow (blended in the outer corner, and along the lower lashline). The pinkish-lilac shadow (on the brow bone and inner corner). I'm wearing a pair of falsies from a Japanese brand that I just discovered and am loving. I can't find the box, but I will do a post on them. Yves Saint Laurent Rouge Volupte Shine in 36 Rouge in Rock . Did you pick up anything from the Rebel Metal Collection?